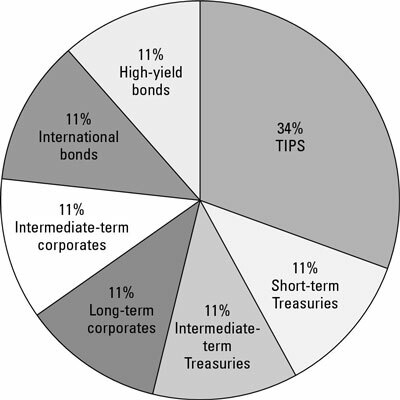 Here are a few examples of bond portfolio allocation solutions. Just as there are no hard and fast rules for the percentage of a portfolio that should be in bonds, there are no absolutes when it comes to what kind of bonds are optimal for any given investor. These folks have a solid portfolio of nearly three-quarters of a million dollars. A fat inheritance is likely coming. They are both working in secure jobs, and when they retire, their (inflation-adjusted) pensions and Social Security should cover all the basic bills. With their children and grandchildren in mind and having little to risk with any volatility in the markets, Jean and Raymond have decided to invest about two-thirds of their savings (all in their retirement accounts) in equities — mostly stocks, with some commodities. They have chosen to invest the other third (about $235,000) in fixed income. Financially fit as they seem, Jean and Raymond still could use an emergency kitty. Because both are older than 59 ½ and are allowed to pull from their retirement accounts without penalty, three months’ living expenses ($15,000) should be kept in cash or in a very short-term bond fund. That leaves them with $220,000. Chances are this money won’t be touched for quite some time — perhaps not until after Jean and Raymond have passed to that great teachers’ lounge in the sky, and their children and grandchildren inherit their estate. That being the case, it warrants investing in higher yielding bonds. Just in case the economy takes a real fall and the lion’s share of the estate goes with it, these bonds should be strong enough to stand tall. About 30 percent of the remaining pot (approximately $66,000) could be put into intermediate-term conventional Treasuries, either in a bond fund or individual bonds. 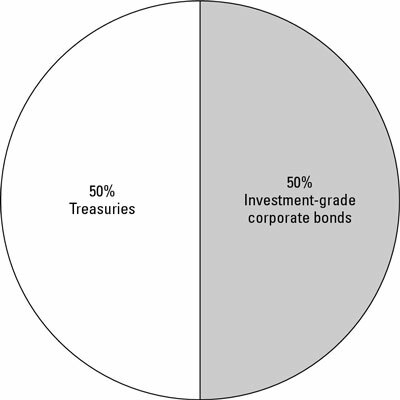 Another 30 percent should go into a fund of investment-grade corporate bonds. The corporate bonds over time will tend to return higher interest than the government bonds but may not do quite as well if the economy hits the skids. And another 30 percent of the bond allocation should go to Treasury Inflation-Protected Securities (TIPS), again either in a TIPS fund or individual TIPS purchased free of markup on the Treasury’s own website. Then, Jean and Raymond might devote 10 percent of their bond allocation to a foreign bond fund. See this chart that reflects good recommendations to Jean and Raymond. Kay’s healthy portfolio of $875,000 is divided 50/50 between equities and fixed income. That equates to $437,500 in fixed income. Where to put it? She should first allot four to five months of her fixed income to either a money market fund or a very short-term bond fund. That would still leave $418,000 or so to invest in higher yielding instruments. It would be good to set up a bond portfolio for her with the intention of making the move to an annuity when Kay is in her mid-60s (provided interest rates at that time are favorable). Kay needs a bond portfolio that will be there for her in four or five years, providing income and, more importantly, providing the cash she’ll need to live on in retirement should the other 50 percent of her portfolio — the stocks — take a dive. With $418,000 to invest in bonds, almost twice what our teacher couple has to invest, she could have a somewhat more diversified bond allocation. Kay may start by taking a third of her bond money ($139,000) and buying either a Treasury Inflation-Protected Securities (TIPS) fund or individual TIPS through TreasuryDirect. These bonds offer modest rates of return but adjust the principal twice a year for inflation. If inflation goes on a rampage, Kay will have some protection on the fixed-income side of her portfolio. As a rule, people with higher allocations to fixed-income should have more inflation protection on that side of the portfolio, as they’ll have less inflation protection from stocks. 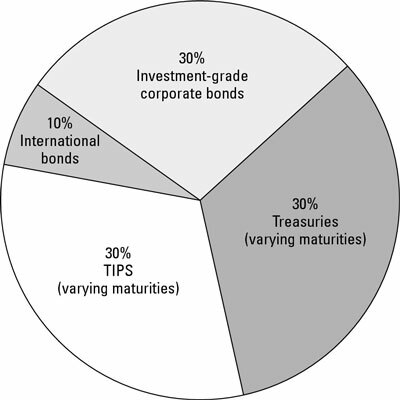 With the other two-thirds of her bond portfolio ($279,000 or so), she should devote equal allocations to intermediate-term traditional Treasuries, short-term Treasuries, long-term investment-grade corporate bonds, intermediate-term investment-grade corporate bonds, international bonds, and high-yield bonds. Juan’s 401(k) has a current balance of just $3,700, but he’s making a good salary. Juan should first save up enough so he can set aside three to six months’ living expenses in an emergency cash fund. Given that his 401(k) money is not going to be touched until Juan is at least 59 ½ (and able to make withdrawals without penalty), he has decided to allocate only 20 percent of his retirement fund to bonds — just about right. The purpose of those bonds is to somewhat smooth out his account’s returns, provide the opportunity to rebalance, and be there just in case of an economic apocalypse. Juan, of course, is prisoner to his 401(k) investment options, whatever they may be. If his employer’s plan is like most, he may have the option of one mixed-maturity Treasury fund and one mixed-maturity corporate-bond fund. Whichever way he goes shouldn’t make a huge difference over the next few years. Should Juan leave his job, he may be able to transfer his 401(k) to his new place of employment, or he may be able to roll it into an individual retirement plan (IRA). The latter is usually better because IRAs typically offer better investment choices at lower costs. At that point, should Juan open an IRA, and should the balance grow beyond several thousand dollars, he should look for greater diversification of his bonds. With $75,000 in savings and the good majority in stocks, Miriam’s 25 percent in bonds ($18,750) must serve two purposes: First, it must provide ballast to smooth out the year-to-year return of her investments. Second, it may well help provide cash flow when Miriam is able to retire and fulfill her dreams of world travel. Miriam is currently making serious bucks in her job as a freelance computer consultant — about $160,000 a year. But she lives in New York City, paying high city and state taxes. She rents rather than owns her home, so she gets no mortgage deduction. Most of her $75,000 in savings sits in a taxable brokerage account. Given Miriam’s relatively high tax bracket, it would make most sense for Miriam to have her $18,750 of bonds in her taxable account socked away in high-quality municipal bonds. Locally issued munis would offer income exempt from federal, state, and local taxes, and these would be good candidates. 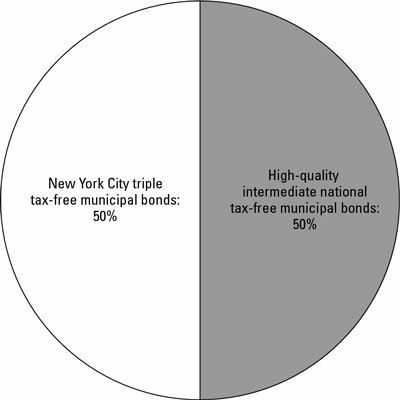 But for the sake of diversification, she should have a mix of both local and national muni bonds. With less than $20,000 to invest in munis, she would be chewed up and spit out by the markups should she start dabbling in individual issues.